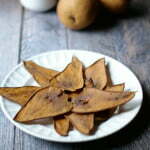 These are very simple to make and a healthy snack to much on. The slow cooking gives the pears a caramelized flavor that everyone will like. Preheat your ove to 225 degrees F.
Thinly slice your pear using a mandolin if possible. Place slices on a parchment lined cookie sheet. Bake for 2-3 hours, checking occasionally to make sure they are done.